The original cathedral roof has been in place since it was completed c1885- 1908. It is now in urgent need of repair. It will cost £3.2 million to replace the 60,000+ slates and preserve the cathedral for future generations. You can help by making a donation via our JustGiving page today, or by taking part in our once-in-a- lifetime Sign-A-Slate campaign. Want to give a gift that will last for generations? Whether for a Birthday, Anniversary, Christening, Wedding or simply, ‘just because’, Sign-A-Slate Gift Vouchers offer the chance for your loved ones to make their mark on history whilst also supporting the Truro Cathedral Roof Appeal. Available for donations for partial slates (£5), full slates (£25) or VIP Experiences (£250), you can get your Gift Vouchers by: visiting the Slate Station in the cathedral (open Mon-Sat 10am-3pm); calling the cathedral office on 01872 276782; or by sending your donation, together with a completed donation form and a note stating it is a gift (including the recipient’s name) by post to: Truro Cathedral Roof Appeal, 14 St Mary’s St, Truro TR1 2AF. Not often can you literally sign, scribe or scribble your mark on history, but for a limited time you can do just that, all in support of the Truro Cathedral Roof Appeal. Sign-A-Slate offers you the chance to sign your name or write a message on the back of one of the 60,000 new slates being used to re-slate the cathedral roof. You will receive a certificate of thanks and have your name listed in our Supporters Book in celebration of your generous support. An entire slate becomes your canvas upon which you can write and draw whatever you wish. Enjoy a an extra special VIP signing experience as you and up to three of your friends and family write your message onto your slate at an invitation only drinks reception hosted by the Dean. Whatever your level of participation, this is a unique opportunity for you to leave a personal and lasting message within this special building. Whether you want to sign your name, draw a picture, mark a special occasion or remember a loved one, your message will be a lasting legacy. If you do participate, we’d love to hear all about it! Share your pictures and messages with us on Facebook and Twitter using #TCsignaslate. To participate in Sign-A-Slate, come into the cathedral between 10am – 3pm Monday – Saturday where you’ll find everything you need. 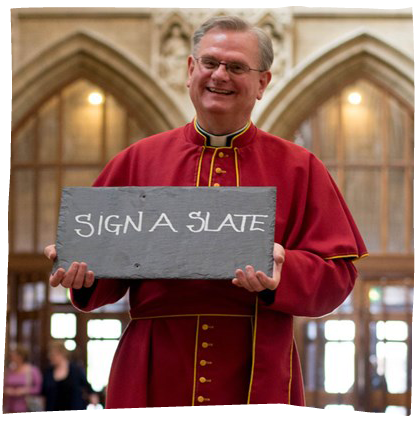 If you would like to take part but can’t get to the cathedral to write on your slate in person, no problem, just click here to download our Sign-A-Slate donation form, complete it and send it to us together with your donation and the wording you would like on the slate – we’ll be happy to scribe on your behalf.